Kurt Smulders composed in various genres, but was famous for his fairy problems. 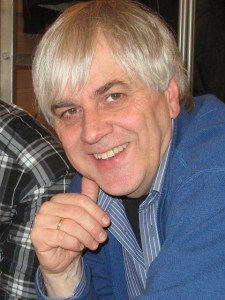 He wrote "Sprookjesschaak: fantasieschaak, systematisch benaderd" (1987) about fairy composition. Rundlauf of the black Knight without capture. Pál Benkö is the well-known o.t.b. GM who left his place in the 1970 Interzonal tournament to Bobby Fischer, who could then win the World Championship title in 1972. He is the Pál Benkö of the Benkö Gambit. But he is also a good composer of studies and problems and was the editor of the problems section of the American magazine "Chess Life". You may read about his biography, written with Jeremy Silman, right here. Loyd's Organ Pipes are reloaded for a special show: this time, they are used for Black and White and the White organ pipes moves are only tries. Castling on each side, mixed-colour Allumwandlung and model mates. 4... Bg3+ 5. f4 ! The e- and f-pawns had to be sacrificed to free the long diagonal for the white King. Borislav Vitanovski composes direct mates and helpmates. The Kings rotate around bPc6 in a) anti-clockwise and in b) clockwise.